With a fantastic range of rides, some superb shows and a convenient location, Pleasurewood Hills offer everything for a great group day out in Suffolk. Located just off the A12 between Lowestoft and Great Yarmouth, Pleasurewood Hills has all-age appeal. For the dare devils there are white-knuckle rides but there's also plenty to do for those with more peaceful pursuits in mind and with three shows included in the entrance price, it also offers great value. Pleasurewood Hills is best known as a family theme park set in an attractive large woodland setting. LOWESTOFT….the history and heritage of Britains most easterly point is everywhere. Parts of Lowestoft date back to the 1500’s and the town is honeycombed with old scores, narrow thoroughfares carved out of the soft sand by people over the centuries for a quick route from the town centre to the beach village…….Safe bathing, golden sands with a blue flag award, an outstanding regional theatre makes Lowestoft one of Britain’s best summer destinations. Crowds flock here every year. A Victorian seafront gardens, the Royal plain fountains, two piers and a rich maritime past told through the towns musuems and heritage walks. It is still a thriving fishing town, you can buy the freshest catch and visit a traditional smokehouse. There is so much to do here with Gt Yarmouth and its golden mile less than 10 miles away..and Somerleyton Hall a mansion with beautiful gardens so close..a fab day out! Lots of pubs, restaurants and cafes…..The Jolly Sailors and The Oddfellows in Pakefield for traditional pub grub and Sunday lunches, The Hotel Victoria with its coastal restaurant but we thoroughly recommend The Thatch for afternoon tea and a piece of cake sitting next to the putting green or stroll further up the prom to Kensington Gardens where you can have a cuppa and a piece of cake and watch green bowls being played. The Kensington Gardens are being lovingly restored with help of a small group of volunteers ' The Friends of Kensington Gardens ' whose plan is to make this a garden where the general public can enjoy many an hour walking through it's grounds. Caldecott Hall is a popular venue with a range of good facilities which offer a pleasant day out to members and visitors. As well as the 18 hole golf course, there's an interesting par three course which demands the use of a range of clubs. The golf course is configured as two loops of nine holes eminating from the clubhouse and is inviting with views from the first tee over much of the opening nine holes which is set on undulating land. The clubhouse is converted 18th century Grade II listed barn and has adjoining changing rooms with oak lockers. The resident professional is on hand for individual or group tuition whilst the Pro Shop is competitively equipped for all your needs. PAKEFIELD….. such a pretty, pretty place. A village nestling on the edge of Lowestoft and Chiltern House, fabulous walks along the Pakefield Cliffs, passing the old fishing boats and the beautiful church set up on the cliff overlooking the sea packed with history of the war when the little church was bombed. 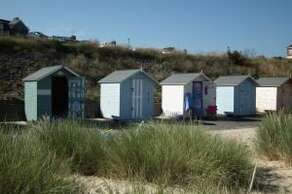 A walk that takes you along the beach to nearby Kessingland and for the REAL walkers onto Southwold. KESSINGLAND……. Visit Africa Alive www.africa-alive.co.uk to see more than 80 species of animal from around Africa. Catch the No 61 bus ( Yellow ) which drops off right outside or drive and go and see the unspoilt beach and have a meal at the Waterfront restaurant (www.thewaterfrontkessingland.co.uk ) overlooking the sea. SOUTHWOLD…….. is one of Suffolk’s most charming seaside towns. No modern theme parks here, souvenir shops, or postcard humour just…lovely, lovely townscape, pretty beach huts, fantastic pier, the lighthouse is a must, a visit to Adnams brewery, shops and boutiques, plenty of pubs, cafe’s and restaurants and the old fashioned harbour with a ferry that rows you across to Walberswick. DUNWICH……legend has it that on a quiet day you can hear the church bells tolling beneath the sea, the ruins of Greyfriars monastery and St James chapel to the leper hospital remain for you to visit. Dunwich heath is a precious heathland which explodes into colour every year…don’t miss fish and chips at The Ship pub, one time smugglers haunt. ALDEBURGH……A World-renowned seaside town on the Suffolk coast, home to the best fish and chips in the country and the greatest classical music festival this side of Vienna…a pebbly beach with fishermens’huts selling their wares. Lots of Pubs, restaurants and cafes, shops and galleries, a cinema and summer theatre. Maggi Hambling’s scallop sculpture is not to be missed! SNAPE MALTINGS…..Is most famous for its music founded by Benjamin Britten, a fab place to visit with items for the home, garden, boutiques and galleries…cafe at the maltings and The Plough and Sail pub all a must! BECCLES……a charming market town on the Southern most end of the Norfolk Broads with an abundance of independent shops, cafe’s, restaurants &pubs. Take in the sights of the church standing proud in the centre of town with a detached tower giving views afar. The museum gives a great insight into the history of the town. You can take a dip in Beccles lido which is an award winning example of community spirit or simply turn up on market day and soak up the atmosphere. Why not go for a boat trip up the river on the Black Dog ferry and stop for a pint &a sandwich at the Locks Public House, then take a stroll back along the river walk. BUNGAY…..surrounded by the Waveney Valley countryside, try some of the way-marked routes through village &valley. Book your seats at Fisher Theatre one of the oldest provincial theatres in the country. Leaf through the pages of the towns history, legends &stories to find out about Black Shuck’s brief but never forgotten reign of terror. Visit the ancient ruins of Bigods Castle.